The race goes on, rain or shine! 2018 Engineering winner Off the Rails through Fell’s Point. 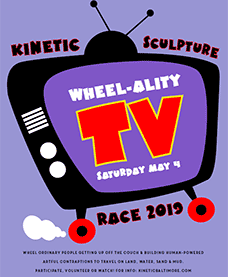 Plan to be in Baltimore for the 21st annual East Coast Championship Kinetic Sculpture Race on Saturday May 4, 2019! The 2019 Spectator’s Guide will be available April 20, so until then you can refer to the 2018 Spectator’s Guide as a general reference for what to expect. Also see our complete coverage of the 2018 race! Only 10 days until the 2019 race! Saturday, May 4. Get working on your spectator costume now! Come to the last volunteer meeting 1pm Sunday, April 28! Free food! The deadline for racer entry forms was April 1! You can still submit your team’s form with a late fee—but it must be received at the AVAM front desk by 5:00pm Sunday April 28. (Postmarks don’t count.) Download the entry form on the Enter! page. See our May 2018 trip to the Golden 50th Humboldt County Grand Championship at 2018 Pilgrimage. Due to persistent spammers, automatic forum registration is disabled. To join the forum, please email Tom at the address at the bottom of the page, with a brief note about your interest in Kinetics and the username you'd like. What’s a Kinetic Sculpture Race? Kinetic Sculpture Racing began in Ferndale, California in 1969 when artist Hobart Brown upgraded his son’s tricycle into a 5-wheeled pentacycle and was challenged to a race down Main Street. (Hobart did not win.) Over the decades since, the California race evolved into a 3-day all-terrain Kinetic Grand Championship including treacherous sand dunes, water crossings, and elaborate sculptures and costumes. You can learn more on Wikipedia including a list of other races nationwide. For more about the Baltimore race, browse the race photo results in the left menu. Where can I see Kinetic Sculptures? 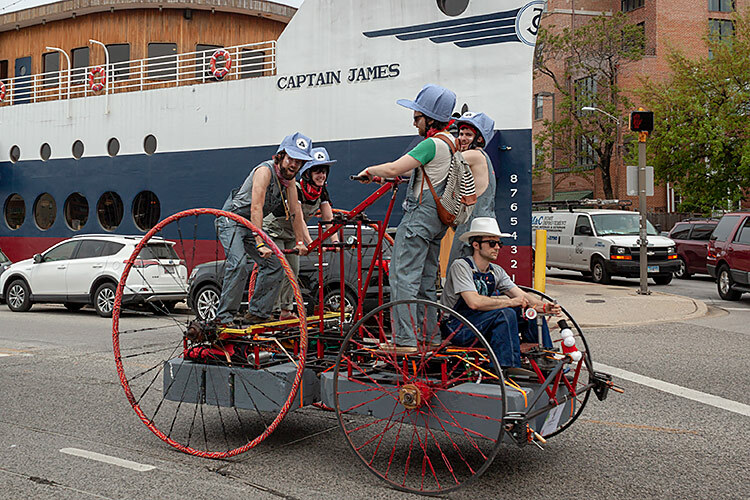 You can go to a Kinetic Sculpture Race on race days, or the American Visionary Art Museum in Baltimore, Maryland. AVAM displays Fifi and their other sculptures year round in the dedicated Sculpture Barn. Learn from Elliot’s How To Build a Kinetic Sculpture reference guide.